Fitted as Standard the Digital Laser is used to scan the surface of the memorial to allow the carving to be a consistent depth. It’s easy and very efficient, producing first class results. Range from 80 to 250mm | Increments from 0.2 to 50mm | Using a Regular Grid matrix. 2 Taking the lower left and the top right X & Y as the scan start and finish. The resulting detail of the scan is a true representation of the memorial surface. The picture is a screen shot of the scan in Aspire. You can project the engraving on the scan to see the simulated result. 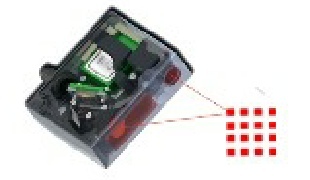 The Laser is standard equipment and works within the GNC control software. Scanning in Real Time is designed to scan and machine without the need to edit - with the minimum fuss. Showing the riven slate scan in Aspire. Allows you to copy an object or carving, allowing editing and cleanup and saving in Aspire for reproduction. Showing a scan of a hand carved rose. 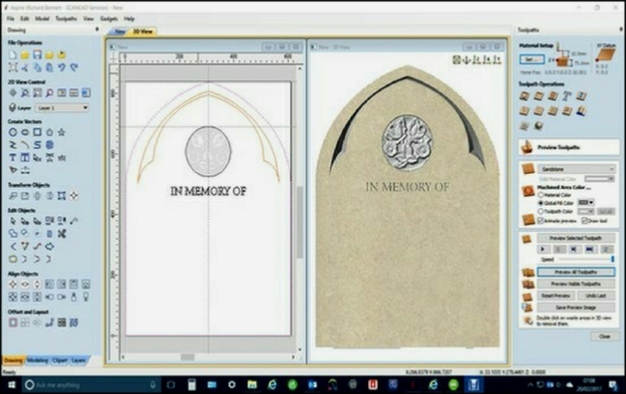 The example shows the original memorial that had to be copied , this was placed on the machine and the Rose carving scanned. The scan was then imported into Aspire and a small amount of editing out the bits not needed. Which was fast and easy to do. The rest of the design was completed in just a few minutes. Surface Acquisition for our Real Time Surface Following. 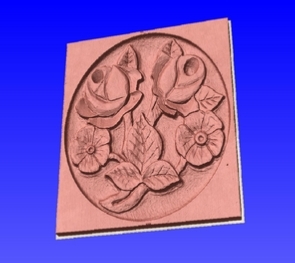 Also simple Copy Scanning for reproduction of 3D carvings. When elements of the object cause a broken beam on undercut areas. Also more complex Copy Scanning for reproduction of 3D carvings. Reducing the limitations of broken beam. This unit is available on request as an alternative to our standard unit.